A wide coalition of Syrian rebel groups have announced that they will boycott political talks proposed by the United Nations. Aron Lund interviews Subhi al-Refai on these developments. On May 13, what may have been the biggest-ever assembly of Syrian rebel factions released a joint statement. It came in the form of an open letter of refusal addressed to the United Nations special envoy Staffan de Mistura. The Swedish-Italian diplomat had originally sought a local freeze of fighting in the Aleppo region, but when this failed—largely due to the refusal of Syrian rebel groups—he was instructed by UN Secretary-General Ban Ki-moon to instead try to organize political talks. In April, the envoy began to invite a wide spectrum of Syrian factions and foreign states for preliminary talks. This process was expected to lead to the convening of a peace conference for Syria, often termed Geneva III. “By the end of June we should hopefully be in the position of reassessing whether there is any convergence on issues of substance or not,” de Mistura has said. Now, the rebels have collectively announced a boycott of these preliminary meetings, putting the whole process in jeopardy. 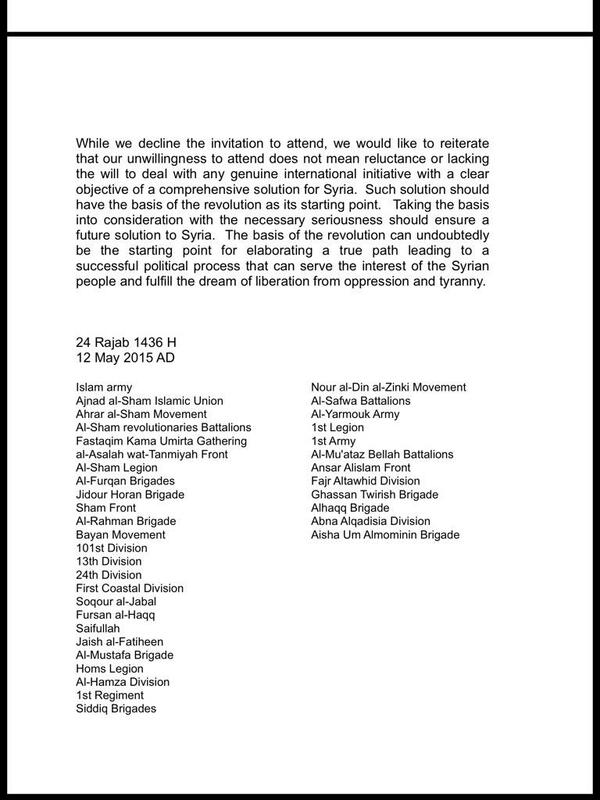 The signatories to the letter include nearly every major Syrian rebel group that could be part of a political process, ranging from Free Syrian Army factions like the Yarmouk Army, the First Army, and the Thirteenth Division to various mainstream Islamist groups like the Noureddine al-Zengi Brigades, the Ajnad al-Sham Islamic Union, and the Muslim Brotherhood’s Sham Legion and more hard-line Islamist groups like Ahrar al-Sham or the Army of Islam. Armed groups that are too far outside the rebel mainstream or hostile to it—such as the Kurdish People’s Protection Units (YPG), or jihadis like the al-Qaeda–aligned Nusra Front, the independent jihadi faction Jund al-Aqsa, and the extremist al-Qaeda splinter known as the Islamic State—were not among the signatories. The letter attacks de Mistura for his alleged bias toward President Bashar al-Assad, but does not call for the envoy’s resignation (also available in English here: 1, 2, 3). It goes on to say that while the signatory groups would like to participate in a political process, they will boycott the upcoming Geneva III talks. The rebels complain that de Mistura’s talks will be based on the Geneva Communiqué of June 2012, also known as Geneva I. This document has been the reference point for all negotiations on Syria so far. It calls for a mutually agreed upon transitional government with “full executive powers,” but does not specifically address Assad’s fate, leaving both sides free to interpret this as they prefer. Geneva I was initially viewed with suspicion by the opposition, but recently the government has been most eager to wriggle free from any talk of transition. While rejecting the Geneva process may help the signatory factions curry favor with Saudi Arabia and other nations that seek to topple Assad, they also risk a clash with the United States, which has tended to view Geneva I–based talks as the only game in town. Another sticking point for the rebels is the fact that de Mistura has invited the government of Iran—a main backer of Assad and his armed forces—to preliminary talks. That 37 different factions were able to unite behind one single position paper is undoubtedly a step forward for the Syrian opposition—indeed, for Syria as a country. The inability of the Syrian opposition to articulate clear common goals beyond the toppling of Assad has always been one of the key obstacles preventing a political solution, with or without Assad. However, the contents of the letter are bound to be controversial, because the document amounts to an all-out rejection of the current UN peace process, without proposing any alternative. Assad’s government is no more enamored of the Geneva I principles than the rebels, but the regime has already agreed to meet with de Mistura. The repeated rebel rebuffs to the UN will surely come in handy for the Syrian president as he attempts to portray himself as the conflict’s only credible interlocutor—the man you can talk to when the opposition will not talk. While the letter surely represents the views and fears of the Syrian rebel mainstream, it may therefore be a risky move. For more on this, I have spoken to the Syrian rebel leader and organizer Subhi al-Refai, who was personally involved in drafting the letter. In November 2014, he was elected executive head of the Revolutionary Command Council (RCC), which is by far Syria’s largest rebel coalition. A native of southern Syria, Refai also chairs the political committee of the Furqan Brigades, a midsize group in the Golan Heights and Western Ghouta area that is part of a loose alliance of Western and Gulf-sponsored rebel groups known as the Southern Front of the Free Syrian Army. In his capacity as head of the RCC's Executive Office, Subhi al-Refai has now been kind enough to share his views with Syria in Crisis. Would you agree that this was the biggest assembly of rebel groups to sign a statement so far, and how did you achieve that? Yes, I agree. We all got these groups together and they made a joint statement. There are three reasons for why this happened now. The first reason is that the groups and their leaders have gained a better understanding of the international situation of the Syrian revolution. We now have a good understanding of this. The second reason was Staffan de Mistura’s positions on the revolution. The factions have now realized that de Mistura is not good for the Syrian revolution. He is not neutral. He is close to the regime and Iran. Of course, this is because of the instructions he is getting. We know that there are common interests among some European states, the United States, and Iran regarding the nuclear issue and other things. They will tell Iran: if you give us something in the nuclear talks, we will help you with Syria. So they have given Staffan de Mistura directives to go easy on Iran and the regime. This has made the Syrian factions and the Syrian people as a whole take a negative view of Staffan de Mistura personally and of the United Nations generally. The third reason is that Syrians have come to understand that the international community doesn’t care about Syria; they only care about their own interests. So, who will provide for the interests and the rights of the Syrian people? It is the armed factions of the Free Syrian Army. They are the ones best able to strengthen the Syrians’ political hand against the regime and the world. You did not demand Staffan de Mistura’s resignation. No, but Syrians have noticed that de Mistura is mainly looking for two things. First of all, he is looking for personal benefits for himself. Maybe he wants the Nobel Peace Prize. Secondly, he wants to help the Europeans and Americans achieve their interests. But now the Syrians have overthrown Staffan de Mistura. Through this statement we have made him a failure. So what exactly are your objections? In January this year, I met de Mistura in Gaziantep in Turkey. I was there as head of the RCC along with the RCC President Qais al-Sheikh. We asked him why he has asked to meet all the armed factions separately. The factions are all in the RCC. We will represent them. We told him that we have noticed that he wants to meet them one by one, in order to divide them and speak to their individual interests, but we don’t accept this. We asked if he has a plan and international guarantees, and he did not. We told him that when you’ve got a written plan with international guarantees, signed by the UN secretary-general, then we can talk. Then he tried to invite all the groups one by one anyway, while he invited the regime as one single delegation. We told the other factions that we do not want this. It is also not clear what they want to discuss with us. What is the basis and what are the limits of these negotiations—should the regime stay, should Assad stay? 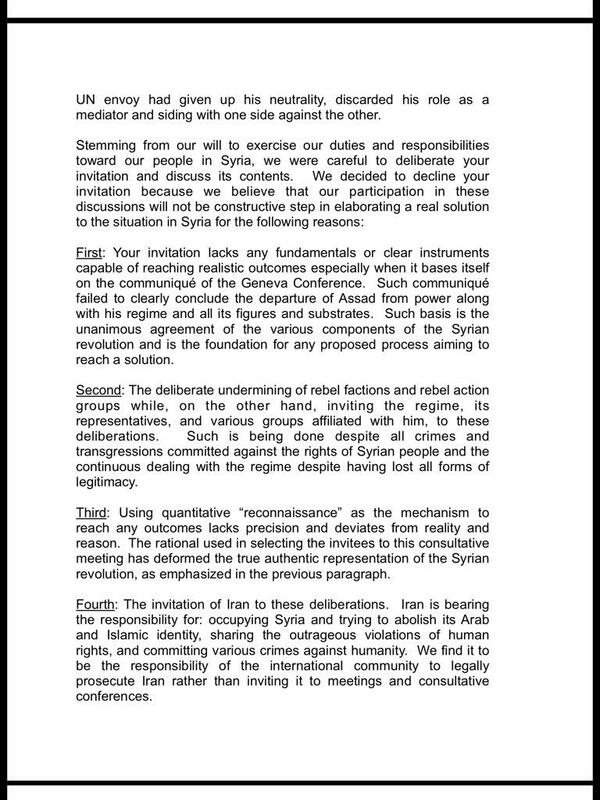 Why do they want to meet us in many delegations when there is only one delegation for the regime? This is humiliating for us, it minimizes our importance, and it is unacceptable. So we got all the big groups to write a long statement saying Staffan de Mistura is dishonest instead of being neutral. But these are not yet negotiations. He has invited everyone to ask them to explain what they want before negotiations can start. You were not asked to sit with the regime, you were asked to present your views and explain your political position to the UN. Our political vision is very clear. We want the Syrian criminal Bashar al-Assad and the others around him, the top people in his government, to be put on trial. The other thing we want is for the European nations and the United States to help us build a national army to help Syria and to make it safe from the so-called Islamic State and other extremist groups. We want them to help us defeat them. The third thing is for them to help us rebuild our country. We want them to help us build a civilized society in Syria, training officials and state employees in order to help Syrian society. But then why did you not go to Geneva and say that? 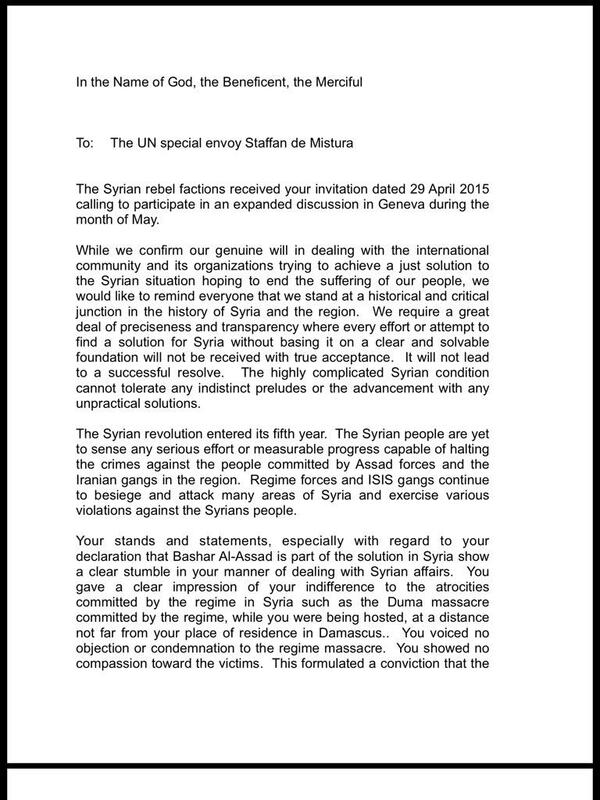 Staffan de Mistura wants us to go to Geneva in 40 different delegations, most of which are pro-regime. Among the opposition delegations, they have invited the National Coordination Body for Democratic Change, Qadri Jamil’s group, that kind of people. It’s a lot of fake opposition from the areas under regime control. Ninety percent of these so-called opposition delegations are really regime delegations. He will set it up to say that we should accept Assad for what they call a temporary period and focus on fighting the Islamic State. There are also some 20 international delegations coming. They will reach decisions that are in practice binding to us, that we will have to abide by, to keep Assad in power in a temporary fashion. The Syrian people refuse this. Then all the fake delegations will come out and say that they accept it, and they will vote for it, and then the governments will put pressure on us. It will end up with us losing our cause, losing our honor, losing face before the Syrian people that have suffered so much. This way, the regime will regain legitimacy—this regime that has in fact already ended! Staffan de Mistura is giving it an emergency shot in the arm to save it. You mention the Geneva Communiqué, or Geneva I. Everyone supports this document except the regime, which tries to get rid of it—and now you, too. What is that about? The Geneva I talks were held three years ago, to start with. They only involved other governments, there were no Syrians invited. This is important. Would you accept that other states gather and decide about your country? Of course not. Secondly, the statement does not go into detail about the fate of Assad and we want clarity on this point. You say you do not want Iran to be invited because you think it is occupying Syria. But if you want a political solution, why are you not talking to those against which you are fighting? We have only one thing to tell Iran: we are going to fight you until you leave our land. This is about dignity. If your country is occupied, you fight them until they are driven out. Iran is a historical enemy of the Arabs and they are trying to seize control of the Middle East, they want to reach the Mediterranean. But we will break them in Syria. When Damascus falls and the Assad regime falls, then Tehran will fall militarily and politically. Then the Iranian people will revolt against them. We want to break them in Syria. We know that the war may go on for a year or two but we know that we have truth on our side and that we will break them. We will drive them out of our country. It is what every people in the world would tell you: my dignity is more important than my life. That is why we won’t negotiate with Iran. UPDATE, May 18: This article originally said that Syrian rebels want help to make Syria "safe from the so-called Islamic State and the Nusra Front". On the urging of Mr. Subhi al-Refai, this has been amended so as to better reflect his views. Mr. al-Refai also wants to clarify that he is speaking in his capacity as head of the RCC's Executive Office and member of its Political Committee, not as a member of the Furqan Brigades. When is the United Nations going to demand compliance with UN charter which includes NON INTERFENCE in the affairs of sovereign countries? The Syrian confict would end promptly if Turkey, Saudi Arabia, Qatar ,France ,USA, UK et al stopped funding, supplying, training and providing weapons and salaries to the jihaid fanatics. Excellent interview. The only thing I disagree with is his lumping of Al Nusrah with Isis. Isis generally fights against all opposition to Assad, theureby benefitting the Assad regime. Al Nusra flights for a lot against Assad and ISiS. But Al al nusra does not want any wester. Involvement at all in Syria. Subhi Al Rifai talks like a lunatic, living in words and isolation. In 4 years the opposition has shown all the faces it can have and none of them has any vision or stature. They all think they can work in a vacuum only with the support of the hateful Sunni countries surrounding Syria. Mr Rifai is full of sarcasm for anyone who does not agree with the narrow view dictated by the Sunni mafia made of the GCC dictators and the paranoiac Turkey. He will move to oblivion just like all the tenors whose angry voice has only caused more destruction and death in Syria.